Whether you’re planning a kitchen remodel or starting fresh with new home construction, a convenient layout with plenty of storage should be a priority. Installing an island is a smart option to consider as you’re looking through kitchen renovation inspirations. At Tiefenthaler, our experts can name several benefits to incorporating this hard-working powerhouse. 1. An island adds storage to your kitchen, whether you keep it open or install additional cabinetry to match the rest of the room. The extra space is perfect for keeping pots and pans, baking dishes and other utensils you like to keep handy while cooking. 2. The additional counter space offered by a kitchen island gives you more room for meal preparation. You can be chopping vegetables or rolling out cookie dough while your helpers are measuring ingredients, and you won’t be running into each other. 3. If you bring a few stools over to the kitchen island, you’ll have additional seating for casual dining or entertaining. Kids especially love these units because they’re a great spot to pull up a chair and do homework. 4. A kitchen island can also be fitted with additional appliances or fixtures in busy spaces. It’s handy to have an extra sink or refrigerator at your disposal when you’re preparing or cleaning up after a meal. 5. 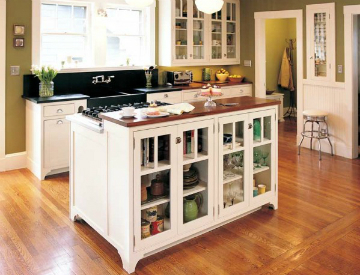 When you fit your kitchen island with casters, you have a portable cabinet that adds versatility. You can move the unit exactly where you need it for entertaining or other household activities. When it comes to kitchen renovation inspirations, the Tiefenthaler team of construction experts and interior design partners have plenty of ideas to help you bring your dream to life. Please give us a call for more information on our home renovations, large scale addition projects and new home construction work.